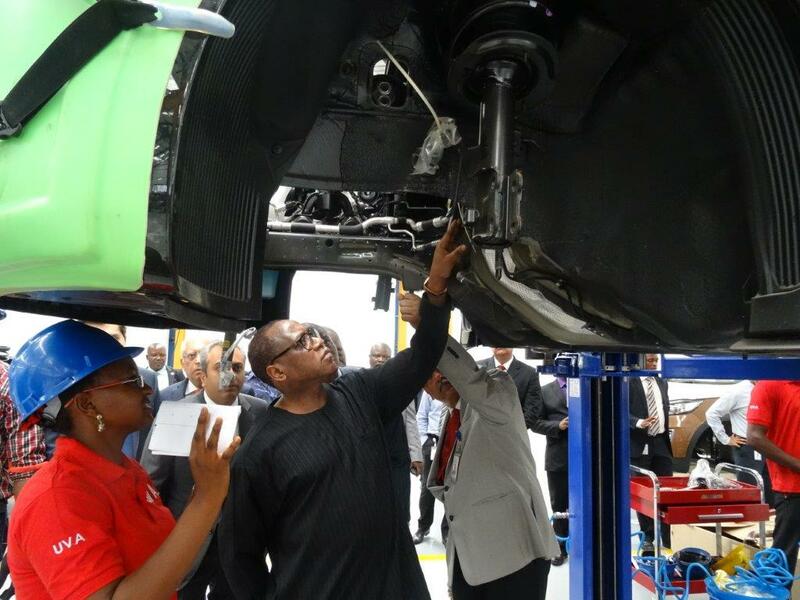 In the middle is Dr Olusegun Aganga, the Minister, Federal Ministry of Industry, Trade and Investment, inspecting the assembly plant flanked by the member of Staff of United Vehicle Assembly Limited during the minister’s working visit to the plant in Lagos. 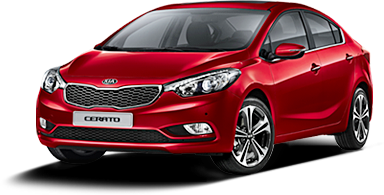 Kia Motors Nigeria, the leading Korean brand in Nigeria, has continuously embarked on promising growth trajectory with a positive growth for over a decade, making it one of the fastest growing automobile in Nigeria. In a bid to further strengthen its leadership role in the industry, it has unveiled a new assembly plant, United Vehicle Assembly Limited (UVAL) in Lagos commissioned to produce 25,000 vehicles per annum. The CEO of UVAL, Mr Jacky Hathiramani, stated at the event that, “the move to establish an assembly plant stems the tide of investment aimed at Nigeria and also keying into the country’s automotive policy. We are committed to making Nigeria a leading auto manufacturing country in Africa and also to contribute immensely to the development of the nation through this multi-billion Naira investment.” He further stressed that the plant has employed engineering graduates from Nigerian universities and will continue to provide employment for Nigerians. “With today’s opening of our plant in Lagos, we have taken our growth commitment to a greater height in Nigeria and reposition our brand to the teeming publics by supporting the proudly Nigeria dream” further stated by Mr Jacky. In a statement by the Chief Commercial officer, Kia Motors Nigeria, Mr Sandeep Malhotra, “the unprecedented stride of Kia brand in the automobile industry in Nigeria has continued to outpace competitions in offering best in class automotive technology to its customers. Premised on our increased acceptability among our valued customers in the last decade, we are now looking at further strengthening our foothold and expanding our reach in the Nigerian market with the new assembly plant”. Delivering on its promise made by Kia Motors Nigeria last year to locally produce Kia vehicles in the country, the company recently launched its made in Nigeria vehicles which include Kia Rio, Cerato, Optima, Sorento, Soul and before the end of the year will be producing all its models ranging from the Sedans, Sport Utility Vehicles to the Pick Ups. Kia Motors Corporation announced today its March 2015 global sales figures (export sales, domestic sales and sales from overseas plants) for passenger cars, recreational vehicles (RVs) and commercial vehicles, recording a total of 269,749 units sold. This figure represents 3.0% year-on-year growth compared to the same month of 2014. In March, Kia posted year-on-year sales increases in China (11.3% growth with 61,431 units sold), the domestic Korean market (8.5% growth with 42,305 units sold) and North America (7.9% growth with 65,426 units sold). Cumulatively through the first three months of 2015, Kia’s global sales totalled 690,775 units for a year-on-year increase of 0.5%. Korea (114,512 units sold), North America (155,659 units sold) and China (166,641 units sold) have seen a 6.0%, 5.8% and 2.0% rise in sales, respectively. 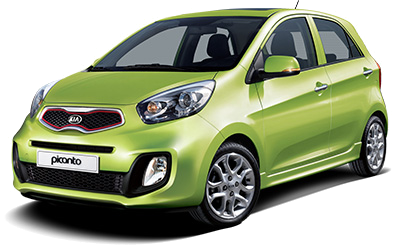 Kia’s bestselling model in overseas markets in March 2015 was the B-segment Rio (known as ‘K2’ in China) with 39,934 units sold. 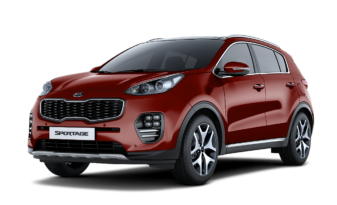 The Sportage compact CUV was the second best seller with 38,165 units sold, while the C-segment Cerato (known as ‘Forte’ or ‘K3’ in some markets), Optima D-segment sedan and mid-size Sorento CUV followed with 35,698, 22,479 and 19,060 units sold, respectively. Kia Motors Nigeria, the fastest growing automobile company in Nigeria, offering the public the very best in cutting edge automotive technology, has announced a new partnership with Class Motors Limited. To further expand its market reach and ease of access to teeming customers in the country, this dealership agreement will facilitate bringing KIA closer to the people in Warri and its environs. In addition to bringing to the foray, vehicles that deliver best-in-class features and affordable price for value, the vision of KIA is to bring its world class facilities closer to its customers and manufacture vehicles that meet their dreams and aspirations. KIA has continued to keep pace with consumers’ evolving wants and needs in order to remain competitive. 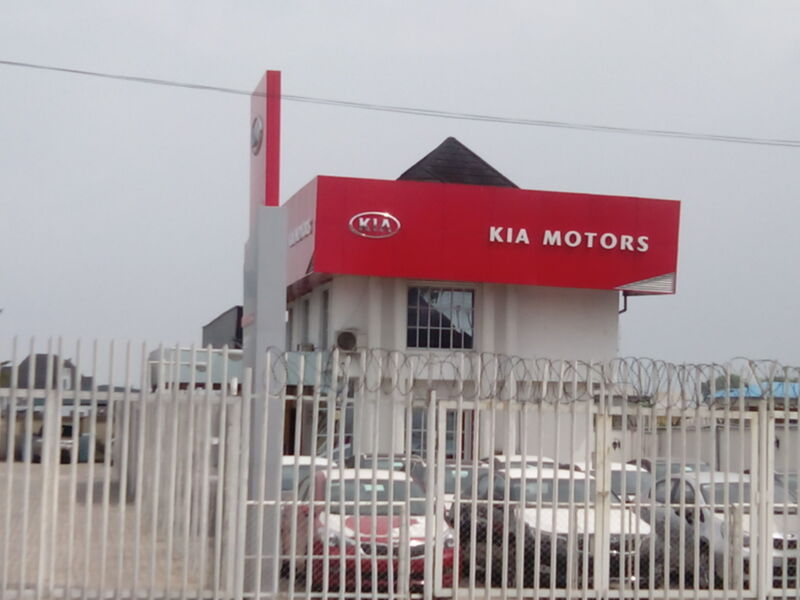 The shifting consumer interests and the need to meet their expectations with exceptional service delivery has propelled Kia Motors Nigeria to extend its reach by signing a new dealership agreement with Class Motors Limited to continue to offer cutting edge automobile technology in the country. Commenting on the partnership, Mr. Ben Edoja, MD, Class Motors Limited, said, “Our relationship with Kia Motors Nigeria is in furtherance of our corporate mission to provide customers with quality vehicles and services. We constantly seek ways to exceed our customers’ expectations and we believe this partnership will give us the opportunity to do just that.” He further quoted that the new Kia franchisee will offer full range of Kia vehicles, from the Kia Picanto to the Kia Quoris, wherein the customers will have ease of access and buy their preferred Kia cars. It is indeed a significant step forward for KIA who has seen substantial growth over the years, making KIA vehicles available to a wider marketplace. The new dealership with Class Motors will facilitate Kia Motors Nigeria meet the objective of providing world class service that is second to none in the Nigerian auto industry. Kia Motors unveiled its latest concept car – the Kia Novo – today at the Seoul Motor Show 2015. Featuring bold, coupé-inspired styling and a minimalist, driver-focused cabin, the Kia Novo hints at the design direction for the brand’s next-generation compact vehicles. Taking its name from the Latin ‘novatus’ (meaning renewed or refreshed), the Kia Novo concept is aimed at modern urbanites with stressful jobs and frantic schedules. Interpreted by Kia’s designers, the name ‘Novo’ represents the concept of making something new and fresh. The Novo establishes a calming, focused environment in which drivers can refresh and rejuvenate as they transition from one life commitment to the next. Fittingly, ‘novatus’ also provides the origin of the English word, ‘innovation’, which the Novo concept brings to life with thoroughly innovative styling and high-tech interior features. The Kia Novo takes inspiration from classic, traditional craftsmanship and vehicle design, and reinterprets it for the 21st Century using modern materials and cutting-edge production techniques to create a sharp, dynamic body over a state-of-the-art powertrain. Designed at Kia’s state-of-the-art Namyang design center in Korea, and based on a specially-adapted version of the Cerato (Forte) platform, the Novo bears a coupé-inspired silhouette and unmistakeable Kia styling. The Novo’s minimal front overhangs, longer rear overhangs and fastback roofline, as well as a slim, long glass area, give it a raked, sporty profile. The smooth, geometric design of the car’s shape is blended with a series of sharp, decisive lines and forms around the body. The front of the Novo sports the latest interpretation of Kia’s hallmark ‘tiger nose’ grille, now wider and more deeply embedded, and slim new laser headlamps. Low, wide air intakes house additional laser headlamps, which frame the Novo’s bold face, emphasize its low, wide stance and give the car a unique light signature. The large front wheel arches lead directly into a strong, consistent shoulder line to meet the rear laser lamps, whose shape echoes those of the front for an identical light signature. The rear of the car uses prominent lines and low triangular exhausts to add greater width and volume to its shape and emphasize the car’s sportiness and on-road stability. Crisp lines surrounding the rear of the car ensure a high aerodynamic efficiency. The Novo’s sharply creased bodywork gives the car a clean, modern appearance when viewed from the side, with strong lines on the doors, skirts and aluminum wing vents. Rear-hinged doors complete the car’s striking profile appearance, with slim, central pop-out door handles running level to the finely-sculpted aluminum door mirrors. The Novo’s diamond-cut alloy wheels feature a similarly sharp design, made up of straight edges and two-tone carbon and silver finish. Completing the Novo’s thoroughly contemporary look are an aluminum rear roof line and two-tone silver and green paint finish. Designed as a sanctuary from the frenzied outside world, the Kia Novo’s cabin is a relaxing space in which to temporarily escape the stresses and strains of modern life. Focused solely on the driver, the minimalist interior provides few distractions from the task of driving, while all occupants benefit from plenty of space, a result of the car’s long body and intelligent packaging. The long, wide dashboard, whose sharp lines are embellished with the use of leather, stitching and aluminum highlights, is angled towards the driver. The instrument binnacle shows relevant information through a compact three-dimensional hologram display, while a ‘blind control’ touch pad next to the steering wheel allows drivers to control the car’s many functions without having to take their eyes off the road ahead. The touch pad incorporates a fingerprint scanner, which automatically sets up elements of the car according to the driver’s preferences, such as music selection, audio volume and the type of information displayed. A wide touchscreen in the center of the dash provides the car’s full range of functionality to occupants. As well as the neat, simple design forms that make up the dashboard and center console, the interior’s four individual dark brown leather sports seats add to the minimalist ambience of the cabin, each made up of simple linear shapes and featuring built-in inertia reel seatbelts to minimize ‘cabin clutter’. The Novo is powered by the latest high-tech production Kia powertrain to match its dynamic looks. A 1.6-liter ‘Kappa’ turbo gasoline direct injection (T-GDI) engine has been paired with the brand’s seven speed DCT to power the front wheels. The result is decisive, sporty performance and impressive fuel economy for Kia’s latest show star. The Kia Novo concept is fitted with innovative new ‘adaptive concave profile’ tires, with a sunken middle section between two contact points serving to cool the rubber and channel excess road water away from the wheels for greater grip. The unique 20-inch tires feature two slim contact points on the outer edges to provide lower rolling resistance and reduce road noise, while contributing to provide a high level of grip under cornering. 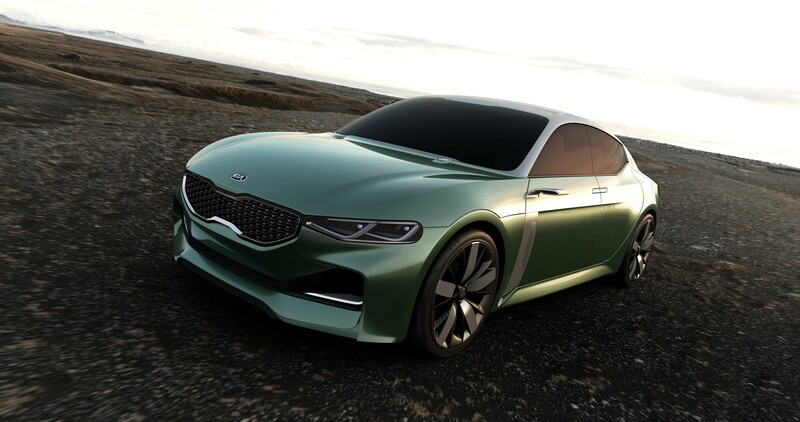 There are currently no plans to bring the Kia Novo concept to production, though Kia has a history of delivering production vehicles that bear a strong resemblance to concept vehicles that precede them. The Kia Novo concept provides a glimpse into Kia’s plans for its future compact car line-up. Five years ago Kia Motors America (KMA) debuted the re-designed Optima at the New York International Auto Show and introduced a game-changing midsize sedan that catalyzed the brand’s design-led transformation. History was repeated when the all-new 2016 Optima, a symbol of the Kia brand’s maturation through continuous refinement and obsessive attention to detail, made its debut here today. 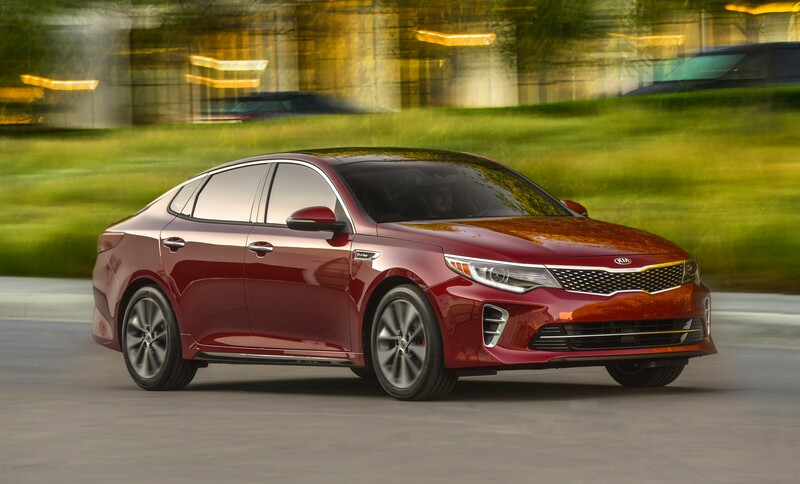 An instant hit with consumers looking for a fresh alternative to an otherwise staid segment, the Optima has been KMA’s top-selling vehicle for three consecutive years, and the all-new model is poised to continue that success. Conceived under the watchful eye of Kia’s president and chief design officer, Peter Schreyer, with modern and instantly recognizable design cues, the Optima maintains its athletic identity but rides on a chassis that is longer, wider and stiffer for improved ride and handling and a more spacious cabin. Available with three engine choices, including a new 1.6-liter turbocharged four-cylinder that’s mated to a seven-speed Dual Clutch Transmission (DCT), the Optima is more confident than ever on the road. The all-new Optima’s roomier, more luxurious cabin features an impressive level of craftsmanship that will come standard across five trim levels – LX, LX Turbo, EX, SX Turbo and SXL – when sales begin in the fourth quarter of 2015. 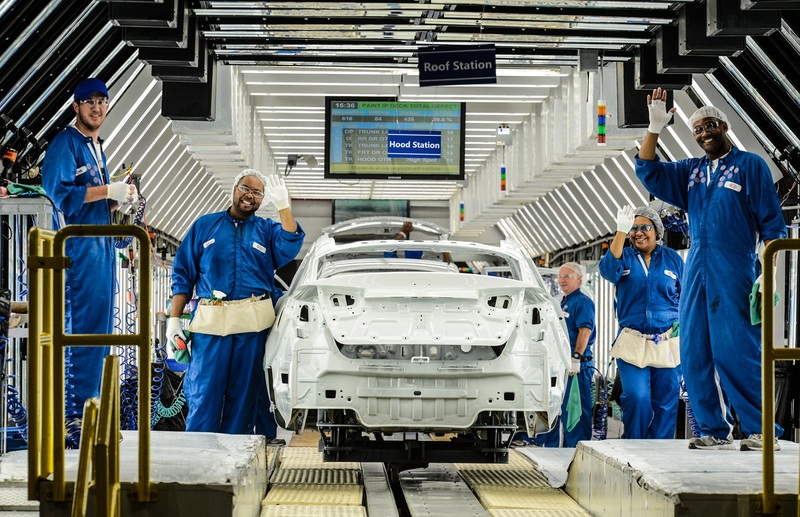 As with its predecessor, the all-new Optima will be built at Kia’s plant* in West Point, Georgia. Pricing will be announced closer to the vehicle’s launch date. “The Optima changed the way people felt about the Kia brand, and KMA owes much of its growth and success to its head-turning design and sporty performance. It was – and still is to this day – a fresh alternative in the midsize sedan segment, and it amplified a five-year design-led transformation that propelled Kia to record-setting sales year-on-year,” said Michael Sprague, executive vice president, sales and marketing, KMA. 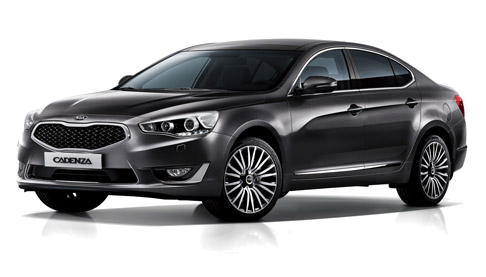 Because the previous generation Optima was such a success story for the brand, Kia’s designers had to strike a delicate balance, retaining the identity of the vehicle while, at the same time, making a confident move forward to keep the car modern and fresh. Sweeping contemporary surfaces and modern architecture inspired the design of the all-new Optima, revealing a sophisticated and dynamic sedan that is instantly recognizable yet has more road presence than ever. The all-new Optima is boldly designed to be functional and sporty with exterior dimensions that are marginally longer, taller and wider. The wheelbase has been extended to 110.4 inches (increased 0.4 inches), and the vehicle has been widened to 73.2 inches (increased 1.0 inch). Both changes enable a roomier and more comfortable cabin with more head room, shoulder room and rear seat leg room. The increased dimensions also allow for more cargo capacity in the trunk. The aggressive front clip pulls the sheet metal taut over the wheel arches, and the swept-back headlights reach deeply into the fenders. On the SX and SXL trims, Kia’s signature tiger-nose grille is hot stamped and composed into a sophisticated pinpoint design that bears a strong resemblance to Kia’s luxury sedan, the K900. The all-new Optima introduces Kia’s first application of bi-functional HID headlights – with available Dynamic Bending Lamps and High Beam Assist – that illuminate the tarmac around corners. The greenhouse silhouette maintains the raked A-pillar and sweeping C-pillar that lend the Optima its sport-sedan appearance. The rear vent windows kick up smartly just ahead of the carved rear fenders. As with its predecessor, the all-new Optima incorporates a raised deck lid, and the use of available LED halo-style tail lights mimics that of the Cadenza premium sedan. The 2016 Optima rides on alloy wheels ranging from 16 to 18 inches, with three new unique 18-inch wheel designs, depending on trim level. Three new exteriors colors compliment the latest Optima’s sophisticated styling: a vibrant blue inspired by a sparkling ocean underneath a sunny sky; a dynamic grey with olive undertones, and a deep red that gains depth from the use of aluminum pigments. Optima’s interior is larger and more comfortable with an innovative and functional cabin that is well-appointed with class-up touches. Drawing inspiration from Kia’s premium and luxury sedans, the Optima utilizes more soft-touch materials throughout the passenger compartment. Optima’s luxurious interior is obsessively crafted with an impressive attention to detail and features real stitching along the dash and doors, complimented by tasteful metallic accents, varying by trim level. The driver-oriented cabin has been simplified with a cleaner, more unified design than the previous generation, with a stronger horizontal plane and a wider center console that help create a greater sense of space. By grouping and reducing the number of functional keys and buttons, Kia’s already-superior ergonomics are markedly improved. The interior design team also paid particular attention to seat comfort. A stiffer seat frame reduces vibration and soft foam in the headrest, upper back and thigh-support areas allows occupants to nestle into seats with deeper side bolsters made with denser, more supportive foam. For extra convenience, heated and ventilated front seats are available with power adjustable driver and front passenger seats. For added convenience, the 2016 Optima offers a height-adjustable front passenger seat, a feature normally found only in premium vehicles. Depending on trim level, the seats are covered in cloth, leather or luxurious Nappa leather and two new interior colors – a rich merlot and a dark aubergine – are available. Kia’s cutting-edge connectivity system, UVO, comes standard with four additional eServices not previously available on Optima: Geo-fencing, Speed Alert, Curfew Alert and Driving Score. Additionally, Optima is Kia’s pilot vehicle for the introduction of AndroidTM Auto and Apple® CarPlay (late availability), which allow drivers to access a suite of core functions from their smartphones. After connecting their smartphone to the head unit via the vehicle’s front fast-charge USB port (another fast-charge USB port is located in the rear seat), the 8-inch touchscreen screen displays the smartphone’s most important features. Core functions including music, messaging, navigation and voice calls are available via the screen, the steering wheel or via voice command2. Kia is one of the first to deliver this technology, which is available for select Android phones operating with Lollipop or Apple phones operating with iOS8.X or higher. Any future third-party apps that are added by either Android or Apple will be available for customers to enjoy from their respective app store. While the standard six-speaker audio system will satisfy all but the most demanding enthusiasts, true audiophiles will gravitate to the available Infinity® Premium Audio System, which includes 14 speakers, Clari-Fi™ technology and an upgraded 630-watt digital amplifier. Clari-Fi is a patented music restoration technology that rebuilds audio signals that are lost in the digital compression process. This technology breathes new life into your favorite music, restoring a high-fidelity listening experience to any compressed digital source. Optima’s premium Infinity audio system also comes equipped with next-generation QuantumLogic™7 Surround technology, which extracts signals from the original recording and redistributes them into an authentic, multidimensional soundstage for playback that is clear, refined and detailed. 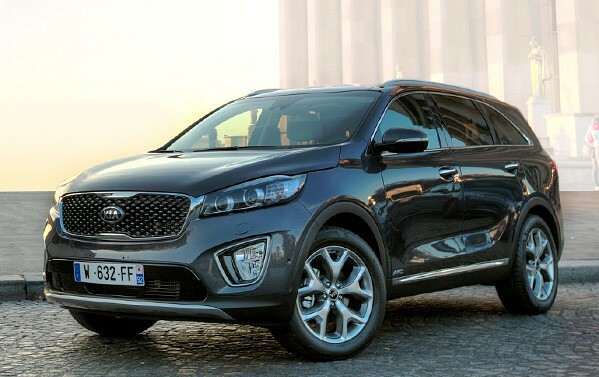 Kia was one of the first automakers to incorporate Clari-Fi technology into their audio systems with the debut of the 2016 Sorento, and Optima is the first-ever Kia sedan to feature QuantumLogic Surround technology. The all-new Optima takes convenience to the next level with a long list of available technologies across the various trim levels. Available on every Optima is a rear-camera display while SX and SXL trims offer an available 360-degree Around View Monitor8. Available driver-aid technology, including Advanced Smart Cruise Control (SCC)8, Blind Spot Detection (BSD)8, Rear Cross Traffic Alert (RCTA)8 and Autonomous Emergency Braking (AEB)8 – which, under appropriate conditions, will bring the vehicle to a complete stop to potentially avoid a collision or reduce damage – makes the task of driving easier and more convenient. Also available for the first time on any Kia vehicle are Bi-function HID headlights with Dynamic Bending Lamps (DBL) and intuitive High Beam Assist (HBA), which recognizes oncoming traffic and automatically switches the lights to low beam until the opposing vehicle has passed. Additional innovations were implemented to reduce NVH, lighten the vehicle and enhance aerodynamics. The 2016 Optima is the first Kia to feature a panoramic sunroof support structure made with carbon-fiber-reinforced plastic, which helps reduce weight and lower the vehicle’s center of gravity. A larger full floor under cover helps reduce wind noise and aid fuel efficiency. Increased dash insulation, added windshield side molding and the increased use of structural adhesive ensure a quiet ride with reduced road and wind noise. Engine mounts, body panels and wheels all are stiffer on the all-new Optima, reducing vibrations, engine noise and road noise. Larger cross-member bushings are utilized to help isolate road and engine noise, as well as reducing engine vibration through the floor and steering wheel. Improving ride and handling was a top priority for engineers. Overall, the chassis is lighter and stiffer, resulting in improved steering response, high-speed stability and handling. Moving the suspension location points of the front and rear sub-frames outward optimizes suspension geometry for a smoother ride over uneven pavement. Where the previous Optima made due with dual bushing mounts, increased lateral stiffness was achieved with a four-bushing mount system for both sub-frames. The increased stiffness pays dividends in improved steering response and tractability through corners. More robust wheel bearings up front and the addition of larger dual lower control arms at the rear also help refine the all-new Optima’s ride and handling characteristics. Available Rack-mounted Motor Driven Power Steering (R-MDPS) improves steering response with a higher gear ratio. All new for the 2016 model is a 1.6-liter four-cylinder turbo engine. The 1.6-liter will be offered on the LX trim. Pushing out an estimated 178 horsepower at 5,500 rpm and a stout 195 lb.-ft. of torque at just 1,500 rpm, the new engine mates to a seven-speed DCT, a first for the Kia brand. The transmission optimizes the engine’s responsiveness for a sporty feel that doesn’t sacrifice fuel economy. Also new for the Optima, Michelin® tires are available on all trims. All three engines channel energy through the front wheels.